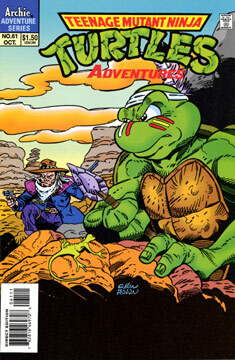 The TMNT, Splinter, Ninjara, Candy Fine, Kid Terra and his friends gather in the desert to place a headstone for Slash, who sacrificed his life to save his friends and the planet Earth from the evil alien Maligna. Raph goes off to brood and Future Raph joins him. Raph asks what will become of Ninjara and him, but Future Raph refuses to give details. On cue, Ninjara arrives and three sit together as the sun sets. In the morning, Master Splinter and the janitor from last issue are doing their morning meditations and speaking to one another telepathically. The Future TMNT and Nobuko open a portal and go back to the future. The janitor then tells the Turtles the creation story he learned from his tribe, the story of how life began on the back of the gigantic Turtle Island.